Casey carded seven birdies as he claimed a share of the Qatar lead with Bradley Dredge. 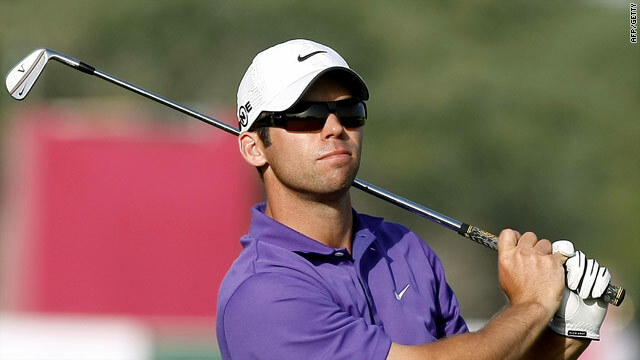 (CNN) -- Ryder Cup star Paul Casey charged into contention at the Qatar Masters with a third round six-under-par helping him to a share of the lead with Bradley Dredge of Wales on Saturday. The 32-year-old Casey is battling the lingering effects of a rib injury which ruined the back end of his 2009 season and has missed the cut in his last three appearances at the Doha Golf Club but he made seven birdies to tie Dredge, who shot a two-under 70. "I am still only 95 percent fit with the rib and had no reason to be confident arriving here given my previous record on this course," Casey told the official European Tour Web site. "But I am playing well now on a tough course where you cannot afford to make mistakes." Dredge is hoping to join Casey as a Ryder Cup player by making the European team for the match in his native country later this year. "Coming from Wales and with the Ryder Cup being played at Celtic Manor, making the team is my big goal for this year," Dredge said. "There are a lot of world ranking points available this week and I could do with them. I will be looking for a big finish." The pair are on 10-under 206 going into the last day but European number one Lee Westwood is only a shot back after a two-under 70, despite cracking the head of his driver on the 11th and having to play the final seven holes without use of his premier weapon off the tee. "It affected my rhythm and it happened at a critical stage of the round. If I could have made a couple of birdies over the closing holes I might have had a two shot lead," he said. Australian Brett Rumford, who had the overnight lead, only managed a 73 but is still in the hunt three shots back. Robert Karlsson of Sweden is tied with him for fourth, while England's Oliver Wilson (72) and Spain's Alvaro Quiros (68) are another shot back.